In 1972, Formula One driver Ronnie Peterson drove a March Ford to finish third in the German Grand Prix, at the Nurburgring. For the record, of the New Zealand drivers in the race, Howden Ganley finished fourth and Chris Amon 15th. Denny Hulme retired after eight of the mandatory 14 laps. Anyway, TAG Heuer watch company chief Jack Heuer (pictured above with Peterson) gave the Swede a gold Carrera chronograph for his efforts that day. 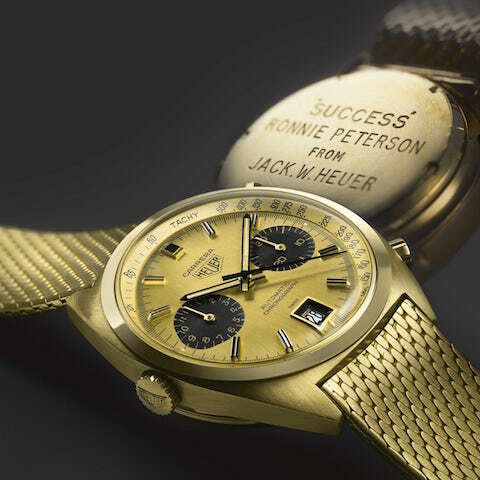 On the back was the engraving ‘Success’ Ronnie Peterson from Jack Heuer.’ In all, fewer than 500 of the yellow gold Carrera chronographs are believed to have been made, and several of them ended up on the wrists of famous drivers of the day. American Mario Andretti has one. Fast forward 46 years, and TAG Heuer has made a single gold replica of the watch its gave Peterson. The gold case, engraving on the back, the Milanese bracelet, and look of the dial are exact reproductions. What is different is the upgraded movement. The watch will be auctioned by bonhams.com in Monta Carlo on May 11 and is expected to fetch between US$24,000-37,000. • Peterson raced in Formula One from 1970 to 1978 for three teams. Over the course of his career, he won 10 Grands Prix and reached the podium 26 times. 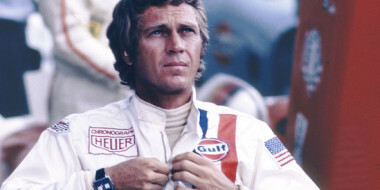 He died in 1978, at 34, as a result of injuries sustained in a crash at Monza.